In a recent posting we discussed that the higher melting temperatures of lead-free solder require reflow soldering temperatures to be higher, thus more electricity is used in lead-free assembly. However, as we calculated, this increased use of electricity is very small compared to all electricity used in the world. An additional concern that some have voiced is the claim that RoHS, with its lead-free requirement, actually makes the environment worse because more tin and silver is used in lead-free solders. They argue that the increased use of these metals, creates mining pollution and has driven the price of these metals sky high. Let’s examine these claims. Prismark has estimated that approximately 90,000 tons of solder are used in electronics, with about 80,000 used in wave soldering and 10,000 tons for SMT soldering. It is important to remember that electronics solder is a subset of all solder. All solder (alloys for brazing pipes etc) uses about 190,000 tons of tin. Solder is the single largest user of tin. See Figure 1. Figure 1. Solder is the largest end use of tin. Tin is the base material for almost all solders. If tin-lead solder were still used predominantly, approximately 57,000 tons of tin (90,000 x 63% tin) would be used annually. With lead-free solder, about 88,000 tons (90,000 x 98% tin) of tin are used per year. This is an apparent increase of about 30,000 MT of tin used each year. However, an interesting thing to consider is that lead-free solder is about 14% lighter than tin-lead solder. Knowing that, and knowing that solder used in wave soldering (remember wave soldering accounts for almost 90% of all solder used in electronics assembly) is consumed by volume not weight (i.e. assuming approximately the same fillet size), about half of this increase is canceled out. This is all a bit confusing however, so it may be best to just to look at tin use. According to the United States Geological Survey (USGS), about 300,000 tons of tin are mined each year. 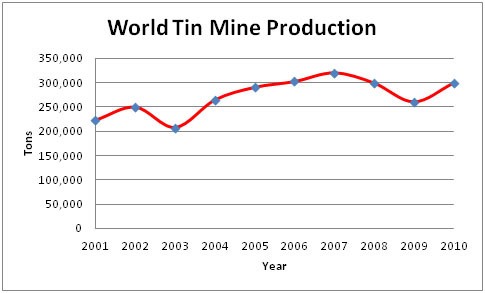 Figure 2 is a graph of world tin production at mines per year (this graph does not show recycled tin.) The amount of refined tin used each year in the US is depicted in Figure 3. Figure 3 includes about 15,000 tons a year of recycled tin. Recycling solder is very cost effective. Scott Mazur just pointed out (Printed Circuit Design and Fab and Circuits Assembly, p 36, August 2011), that recycling solder dross is 10 times as cost effective as recycling aluminum cans. Looking at these graphs, it is hard to say that the amount of tin used has gone up since RoHS. 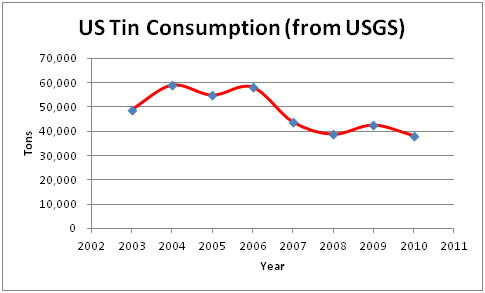 It would appear that tin use is likely more affected by the economy and that it is really difficult to see an effect from RoHS’s July 2006 enactment. Figure 2. World Tin Production at Mines. Most wave soldering solders have low or no silver. So, about 3% of the 10,000 tons of SMT solder, or 300 MTs of silver, are used in electronics. This is about 1.5% of the 22,000 MTs of silver produced each year. Silver use in electronics does not make anyone’s list of top silver usage. Figure 3. US consumption of tin has decreased since RoHS was enacted. So electronics solder use since RoHS has not caused tin use to increase, nor is it a significant factor in silver use. Therefore it is highly unlikely that electronics' use of tin or silver has been a prime driver in their stunning price increases in 2011.